We are now officially in our second year of the Cottage Cooking Club; a group of international blogger's cooking together and then posting our experiences along with the Hugh Fearnley-Whittingstall's cookbook, "River Cottage Veg". Our group is meant to be a project aimed at incorporating more vegetable dishes in our everyday cooking, and is and has been inspired by our dedicated leader Andrea of the The Kitchen Lioness. Every month Andrea picks one recipe from each of the ten chapters. We then pick and choose which one or ones we want to blog about in a single post. Every month is special as each one has delicious and interesting vegetables unique to that season and climate. The first recipe I prepared was the Cambodian Wedding Day Dip. This can be eaten hot or cold and a great appetizer for a party, serve with pita bread, crackers or veggies. Add rice and you can make it a proper meal. Basically it is sauteed mushrooms, chilies, garlic, curry powder, crunchy peanut butter, coconut milk and a few other accommodating ingredients. I tried to find the origin of this delectable nibble but I was not able to find a thing. The mushrooms are finely diced, cooked over high heat. Spices and coconut milk is added and then mixture is reduced down. You will find yourself going back and forth to this one as it has so many levels of flavor, one of my new favorites to say the least. The second recipe was the Herby, Peanutty, Noodly Salad. As you can see above this could easily be a main dish. This hits the spot when you’re hungry for a more substantial salad, it has the carbs, the herbs, the greens and like all good salads, a great dressing. Another new favorite to add to my list. Love this cookbook. Recipes adapted from the River Cottage Veg, by Hugh Fearnley-Whittingstall. First recipe; from the chapter "Meze and Tapas" Cambodian Wedding Day Dip" (page 299). Second dish from the chapter "Hearty Salads" Herby, Peanutty, Noodly Salad (page 71). To see what recipes the other members chose for this month, head over to the LYL post for May 2015 on the CCC website, by clicking here. Just a quick note, my husband and I just arrived at our home in Oregon for the summer. I will be back to blogging and commenting this week. Thank you for all the heartfelt comments about my mother; they were very much appreciated. Must make that dip!!! I guess I didn't really pay as much attention as I should have. It looks and sounds delicious!! I did make the same salad, as well as the spouffle. Both were big hits - and such fun recipes to make. So happy that you enjoyed your choices!! Hi Candy, we did enjoy the recipes I prepared, love this cookbook more and more each month. Thanks! Welcome back Cheri. Hope all is well - it certainly looks like your kitchen is putting out some amazing recipes! Have a great weekend. Thanks Tricia, feels good to be back such a supportive group of people. Having fun with this cooking group. Cheri, so nice to see that you are up to blogging again - hope things are well. I see that you also made the Cambodian Wedding Day Dip - it is truly an amazing recipe and one that I will make many times over and you are right about the pairings, pita crisps, fresh bread, veggies all go so well with this - and the layers of flavor are outstanding. The Herby, Peanutty, Noodly Salad is another one of those winning recipes and certainly very versatile with respect to the veggies, the herbs and the noodles used. This time I went with wholewheat spaghetti (I was meant to feed a crowd and it did). Thanks Andrea, it feels good to be back, blogging is such a wonderful way to connect with others. Take care. awesome and damn delicious dishes!!! Thanks Dedy, appreciate the comment. Welcome back, Cheri. Both dishes look great! It looks as though I missed out on something delicious by not making the dip but I did make the salad and enjoyed that very much. Thanks Zosia, I agree the salad was wonderful, better yet the dressing. Another great month. So Happy to see you Cheri! The dip looks quite good though it was one I simply could not fit into the timing- another time though. Really enjoyed the Noodly Peanutty Salad very much too. Many of these recipes are quite terrific! Nice Post and glad to see you back. See you soon. Thanks Peggy, it is good to be back to cooking and blogging again. Have a great week-end! That Cambodian dip looks incredible, I need to make it asap! Thanks Mike, it really was good. Take care! Hi Charlie, Oregon summers are the best.....lots the berries and great weather. Thanks for stopping by. Thanks Dena, it is nice to be back. Love the serenity. This looks like such a tasty, heathy dish! Thanks Nancy, we really enjoyed it. Take care! Very happy to see you, Cheri! My thoughts and prayers have been with you. That fresh salt air and beautiful forests will be good for you! Love your recipes and I'm a huge fan of the Noodly Salad - that is calling my name. Thanks so much Robyn, appreciate your kind comment. I'm already starting to feel better. Wow, these are both fascinating recipes, I want to make the dip just for the name alone! Thanks Sue, the dip is now a new favorite. Have a great week-end. Both dishes look and sound fantastic so I would have a hard time to choose a favorite! Thanks Daniela, I am loving this cookbook! Take care! Thanks Theresa, so nice to be here. Welcome back to the PNW, Cheri. You are so lucky to have the best of both worlds for your homes. Both recipes sounds delicious! Thank you Susan, I feel very fortunate. Hope you had a great week-end! The Cambodian Dip seems flavourful. Thanks for sharing ^-^! Thank you Karen, it was delicious. One of my new favorite dips. I just commented on your April 30th post after losing your Mother, Cheri. I am pleased to see you posting this week. After Michael died my daughter took over, making and posting about my French Fridays recipes for a few weeks. Then she handed Lights on Bright back to me and told me to get cooking and writing again. It was structure and "my job" and it was a good thing to do. Your mushroom dip and noodly salad were both recipes I picked to make this month and didn't get made. I especially liked your noodly salad. It seems like something I can stuff in my back pack and eat while hiking and rangering this Summer (if Summer ever comes to the Rockies). Savor your time in Oregon. That seems to be a great place to spend the Summer. I am trying to subscribe to your blog but haven't succeeded yet with the three options. I'll get it, never fear. Thank you Mary for the very kind and heartfelt words, I really appreciate it. It feels good to be back blogging again I have made so many wonderful friends. That Cambodian dip looks really great and would be fantastic to make some wraps with it too. The dip looks super tasty!! And I love the name haha :) I'm always looking for new ways to incorporate veggies into my meals- as much i love veggies I always find I'm cooking them the same couple of ways! The salad looks great too- love the amount of greens in there! Hi Von, I do the same thing, thats why I am having so much fun with the Cottage Club cooking group. The dip looks terrific! Such a tasty, healthy dish! Thanks for sharing! I din't get the Cambodian Wedding Dip made but it is on my list of recipes to make. The Noodlly Salad was one of my favorites and I will make it again! Hi Guyla, I thought the same thing, the noodly salad was delicious. Cheri - how are you? Hope you are hanging in there, and it's so good to see you cooking again. Thank you for sharing these wonderful recipes. These vegetable dishes are really inspiring and they always look so appetizing! Thanks Mindy, I loved the combination of ingredients in this one too, you can't go wrong with pasta and greens. I love that cookbook too. I think the wedding day dip looks great! Thanks Beth, we really enjoyed this dip, it was great with both veggies and crackers and I know it would be good with pita bread too. Take care. the cambodian dip is right up my alley - i love having samples of different foods that can be slathered on bread or crackers, picnic style. i love the look of the herby noodle salad. seriously, both dishes look like the best addition to a potluck or picnic. hope you're having a great start to your summer in Oregon. Thanks Lan I am, have been working feverishly on my garden. Both of these dishes sound delicious, Cheri, and I've never heard of that dip before! Being a huge mushroom fan, it sounds wonderful! Thanks Marcie, I never have either, tried to google some background info on it but found nothing. Both of these recipes look so good and full of flavor, Cheri! My husband and I just love mushrooms so I know we would like those, especially with spices involved. I bet the texture as well as the flavor of the salad is great with the peanuts. Great dishes! The texture was very nice, I did not know what to expect, but was plesantly surprised. I'm not a huge fan of mushrooms, but I MUST try that peanut noodle salad!! Hi Joanne, the peanut noodle salad was the best and the dressing was perfect. Thanks Ritu, these were both great dishes. Good to see you blogging again! These dishes look wonderful -- so full of flavor. Thanks so much! Thanks John, it took a little time but I'm back at it. I too did a search on the origin of the dip, and came up empty handed. I had my doubts, but really enjoyed it in the end. We also enjoyed the salad - will make for a wonderful, summer time, light dinner. Hi Cathleen, I wonderful if there is another name for the dip, was curious about the origin as well. Love the salad! I am so glad to see you back blogging...and hope you are doing just fine. Both dishes look great...the mushroom dip and the noodle with vegetables. Ah Cheri! You are here and with us and what a great recipe. I love everything from that part of the world! Thanks Abbe, I do too. Thanks Helen, I know 2 years, that's amazing, when I first signed up I thought it was 12 months, just found out different. Have a great week-end! Cheri that dip looks so delicious!!! love the dip! So delicious! Hi Cheri, that noodle salad was good, wasn't it? And I need to try that dip. You make it sound delicious. I can't believe it's already been a year of CCC. I didn't join until a few months in, but still, the time is flying. Hi Betsy, I know I can't beleive it's been a year already.......we are halfway there. Thanks Phi, I know time goes by so fast. This looks amazing, I will have to give it a try soon. Thanks for all the wonderful recipes. Can't wait to try this, looks so good. Hard to understand what you mean. 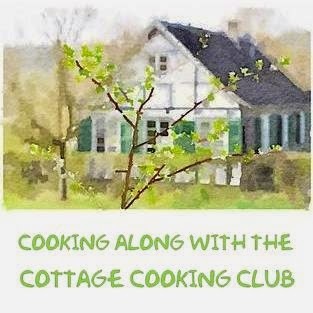 This is a post about the Cottage cooking club, it's a group of bloggers that get together each month and prepare recipes together.